Located in the Pioneer Frontier℠ area, Wurstburg Grill is home to all the family favorites! 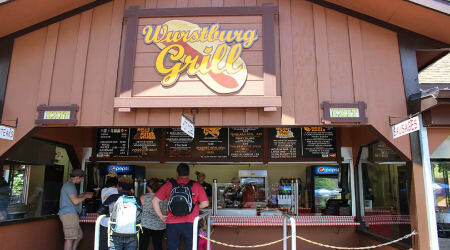 Hot dogs, sausages, and freshly cut potato chips are on the menu. The perfect meal or quick snack! Pork, Water, Corn Syrup, Sodium Lactate, Salt, Dextrose, Spices, Paprika Monosodium Glutamate, Flavorings, BHA, Propyl Gallate, Citric Acid. Pork, Beef, Water, Corn Syrup, Salt, Sodium Lactate, Dextrose, Monosodium Glutamate, Flavoring, BHA, Propyl Gallate, Citric Acid. Pork, Beef, Water, Salt, Corn Syrup, Spice, Paprika, Dextrose, Onion, Garlic, Sodium Erythorbate, Sodium Nitrite, Flavoring, Collagen Casing. Pork, Beef, Water, Salt, Corn Syrup, Hydrolyzed Soy and Case in Protein, Flavorings, Sugar, Sodium Phosphate, Milk Protein Hydrolysate, Paprika, Garlic, Spice, Sodium Erythorbate, Sodium Nitrate. Steak -Beef, Cheese, Dehydrated Garlic, Black Pepper, Salt, Sugar, Dehydrated Onion, Dehydrated Red Bell Pepper, Parsley, Garlic Oil, Chili Pepper, Black Pepper, Celery Seed, Nutmeg, Onion, Paprika, Maltodextrin, Garlic, Silicon Dioxide, Annato. 10" Roll - Enriched Wheat Flour (Wheat Flour, Barley Malt, Niacin, Iron, Thiamin Mononitrate, Riboflavin, Folic Acid), Water, Contains 2% or less of the following: Yeast, Salt, Sugar, Lard, Wheat Gluten, Dough Conditioners (DATEM, Potassium Bromate), Yeast Nutrients (Ammonium Sulfate, Calcium Sulfate), Soy Oil, Calcium Propionate (Preservative). Frank - Beef, Water, Salt, Contains less than 2% of Flavoring, Potassium Lactate, Corn Syrup, Sodium Phosphate, Paprika, Sodium Diacetate, Sodium Erythorbate, Sodium Nitrite. Roll - Enriched Wheat Flour (Wheat Flour, Barley Malt, Niacin, Iron, Thiamin Mononitrate, Riboflavin, Folic Acid), Water, Sugar, Lard, Contains 2% or less of the following: Yeast, Salt, Dough Conditioners (DATEM, Potassium Bromate), Yeast Nutrients (Ammonium Sulfate, Calcium Sulfate), Soy Oil, Calcium Propionate (Preservative). Taylor's Pork Roll - Pork, Salt, Sugar, Spices, Lactic Acid Starter Culture, Sodium Nitrite, Sodium Nitrate. Pretzel Roll - Enriched Wheat Flour (Wheat Flour, Barley Malt, Niacin, Iron, Thiamin Mononitrate, Riboflavin, Folic Acid), Water, Brown Sugar, Dark Brown Sugar, Molasses, Lard Yeast, NB CT-1 #34974, Caravan Wheat Flour, DATEM, Salt, Calcium Stearoyl Lactylate, Calcium Sulfate, -2% Partially Hydrogenated Soybean and/or Cottonseed and/or Canola Oils, Ascorbic Acid, Potassium Iodate, L-Cystine, Azodicarbonamid, Enzymes, Ing-Sodium Hydroxide, Monoglycerides. Kids Frank - Pork, Beef, Water, Contains less than 2% of Salt, Potassium Lactate, Flavoring, Sodium Phosphate, Paprika, Sodium Diacetate, Sodium Erythorbate, Sodium Nitrite. Roll - Enriched Wheat Flour (Wheat Flour, Barley Malt, Niacin, Iron, Thiamin Mononitrate, Riboflavin, Folic Acid), Water, Sugar, Lard, Contains 2% or less of the following: Yeast, Salt, Dough Conditioners (DATEM, Potassium Bromate), Yeast Nutrients (Ammonium Sulfate, Calcium Sulfate), Soy Oil, Calcium Propionate (Preservative). Potatoes, Soybean Oil, Dehydrated Garlic, Black Pepper, Salt, Sugar,Dehydrated Onion, Dehydrated Red Bell Pepper, Parsley, Garlic Oil.